Photographers, make your dreams come true in the new year! Home / Magazine / Photographers, make your dreams come true in the new year! Most people start the new year with new year resolutions, and we might be able to help you make one come true! For Watchisthis?! 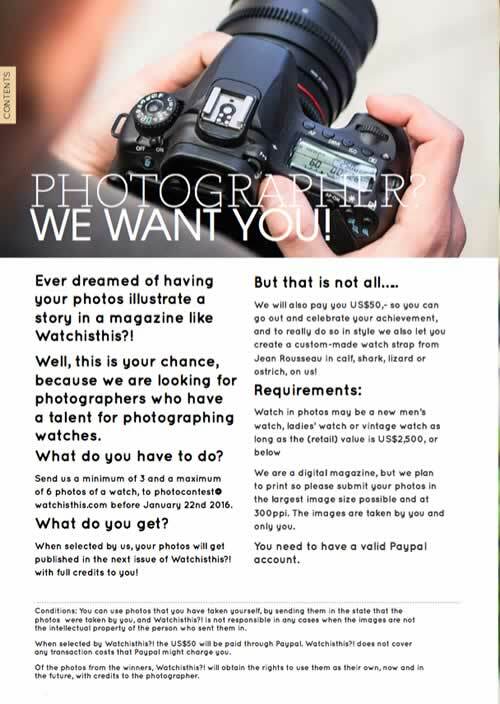 Magazine we are having a contest to for photographers who think they can shoot some nice pictures of high-end watches priced $2.500,- and below! Think you are up for the challenge? Email your photo’s to photo contest at watchisthis dot com to participate! Of course you are not doing this only for the glory! The wining photo’s will be featured in the Spring issue of Watchisthis?! Magazine with full credits, we give you US$50,- to go out and celebrate, and a custom-made watch strap by Jean Rousseau to do so in style! For the exact rules and regulations, please check page 62 of Watchisthis?! Magazine! We are looking forward to receive your entry! helo ! i’m a french freelance in 3d , i work for Franck Muller , can i post a 3d picture on this event ? Yes, as long as the 3D image is of an existing watch model that is currently available on the market. Of course this watch should be priced US$2.500,- or less.